It’s been a while – I know. There’s been a lot going on around here! * I have converted to MAC – woo-hoo! Not completely, as I still have to get the new version of Photoshop and move files, etc. Thank goodness for my high-tech husband who makes all this stuff such a breeze! * I have completely re-done my home office for the new year (I’ll post a picture later). Out with the cramped, traditional desk and in with the IKEA style modular desk top with tons of storage cabinets behind me. Thank goodness for my husband AGAIN, who has moved stuff, built stuff, plugged and unplugged computers, printers, routers, etc – and is always ready to do more. I honestly don’t know what I would do without him. * The baby room is looking fantastic (I’ll post a picture of that eventually too). We are in the final countdown and trying to get all of the “baby-goods” out of storage and ready for our new arrival. Jeff’s work has become very busy with the New Year and Kylie is keeping us on our toes – lots of tantrums and willfulness lately. I’m getting over what seemed to be a month long illness (cold/flu/something or other) and now I’m trying to catch up on some sleep before the BIG DAY! I’ll close with a picture. I think I’m raising a future photographer! We got Kylie one of those durable digital cameras for xmas and she loves to chase me around with it. I guess what goes around comes around right?? 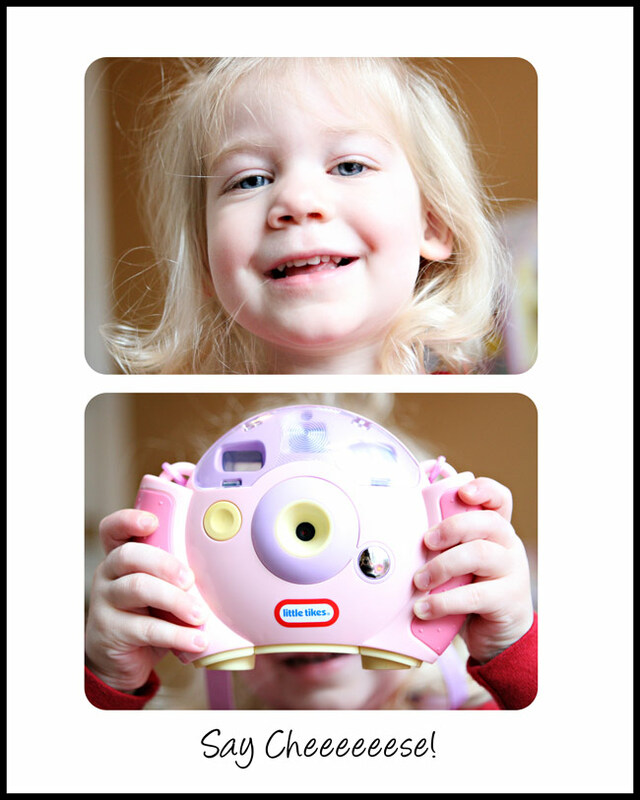 Amy – We bought one of those cameras for Savannah…a gift from Gage when he was born. I think I need to take some time to learn to use it b/c I can’t make it take a picture without a 5 second delay. Maybe Kylie can give Savannah some tips!